Helen has been shooting for many years with her team of Hungarian Vizslas and Springer Spaniel. The dogs accompany Her on a range of different types of shoots from large commercial events to a pleasant day rough shooting. Helen has a Distinction in the certificate in Canine Training and Behaviour from Warwickshire College and has taught the same course at two levels for 6 years. She also has the City and Guilds level 5 qualification in Teaching. She has obtained the Learning About Dogs Clicker Trainers Competency Assessment Programme levels 1, 2 and 3 with Distinction and is an active assessor for the scheme. Alongside this she has trained with Kay Laurence for many years and taught a variety of Clicker Training workshops at Wagmore Barn in Gloucestershire. She also teaches a variety of Clicker Training and Gundog courses around the world as well as at her own training center in the UK. 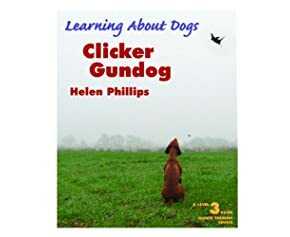 Helen is also the Author of the popular ‘Clicker Gundog’ Training Book. Gundogs have inherited specialised skills that have been honed over hundreds of generations. Helen has been taking this natural skill, enhancing it and using it to enrich a working partnership that is a joy to experience. Good field work is built on an understanding of the dog's ability to maintain self control and the handler's ability to understand this and the environment. With Clicker Training your gundog and you can learn how to develop a partnership using reinforcement strategies in depth. Learn how to use careful planning so that you build a high level of control that exceeds the stimuli of the hunt and shoot. Through Clicker Gundog she has developed a range of workshops and seminars to help teach these skills to both the handler and the dog. The seminars and workshops are held at a training facility that has been developed especially for the purpose and incorporates a working shoot so that both dogs and handlers new to the sport can experience what a shoot is all about, and those with experience can then practice their skill in the working environment. Hier finden Sie Links zu Helen Phillips. Mehr Informationen finden Sie auf Ihrer Facebook Seite Helen Phillips.